Texas Summers are long...and extremely hot. Luckily, April and May are pretty much perfect for al fresco dining. The weather is already starting to get warm around here, but evenings are still pretty with nice breezes – perfect weather for an impromptu picnic dinner! This week, #SundaySupper bloggers are sharing our favorite picnic foods. Our host is T.R. from Gluten-Free Crumbley. To me, Spring means enjoying lighter foods with fresh seasonal produce. Enter my Layered Mason Jar Pasta Salad for Two. It's a snap to assemble, and it's easily portable! Simply layer your favorite ingredients in a large Mason jar, then store your personalized creation in the fridge until you’re ready to head outdoors for your picnic. I especially love that this pasta salad can be customized according to your tastes – or to use whatever is on hand in the kitchen on a given day. 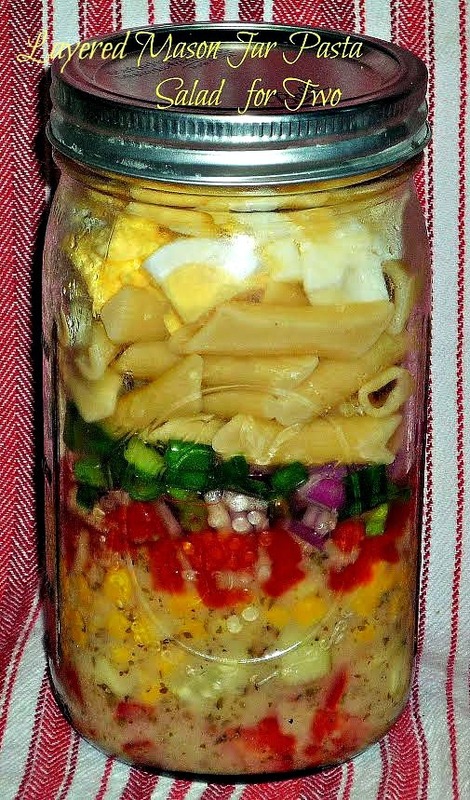 I layered store-bought lime vinaigrette, high-fiber penne pasta, Spring veggies, cubes of sharp cheddar, and boiled eggs in my jar. Then, I sealed and refrigerated the jar overnight. When ready to serve, simply give it a shake and pour into a serving bowl. As an added bonus, the colorful layers are so pretty to look at. The key is to layer as follows: dressing, veggies, pasta, and protein. Step 1: Add the vinaigrette to the bottom of a large Mason jar. Layer the cucumber, corn kernels, and tomato. Step 2: Layer the chopped onions, cooled penne pasta, boiled eggs, and cheddar. Seal the jar and refrigerate for at least 4 hours – but you can assemble and refrigerate up to 3 days ahead. Step 3: To serve, give the pasta salad a good shake to disperse the dressing. Pour the contents of the jar into a serving bowl and toss to combine all of the ingredients. Too simple...and so flavorful! This colorful pasta salad is a snap to put together, and it’s perfectly portable for Spring picnics. To round out our picnic menu, I picked up a roasted chicken from the deli -- along with chocolate chip cookies and fresh strawberries for dessert. Iced tea is a traditional Southern picnic beverage that would work great here. 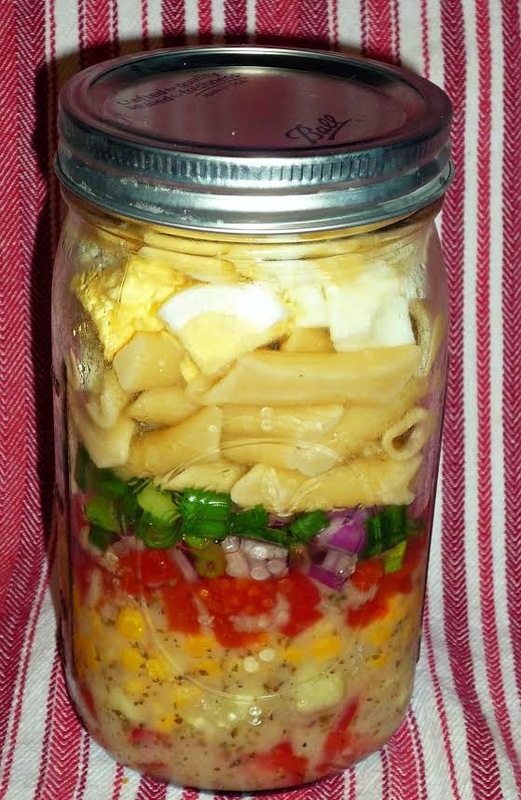 I hope you give my Layered Mason Jar Pasta Salad for Two a try, subbing in your favorite veggies and protein. Be sure to check out all of the great picnic recipes that the #SundaySupper crew is sharing this week – whatever you’re looking for, we’ve got you covered! Be sure to join the #SundaySupper conversation on Twitter this evening! We tweet throughout the day and share recipes from all over the world. Our weekly Twitter chat starts at 7:00 pm ET/6:00 CST. Be sure to follow the #SundaySupper hashtag and remember to include it in your tweets to join in the chat. To get even more great Sunday Supper Recipes, simply visit our website or check out our Pinterest board. Would you like to join the Sunday Supper Movement? It’s easy. You can sign up by clicking here: Sunday Supper Movement. These are perfect for a picnic! Yum!